Farm Yard Self Catering Guest House - Harrismith Accommodation. 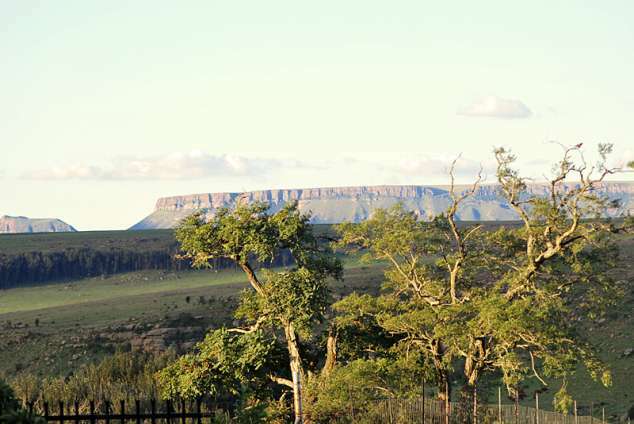 Centrally situated halfway between Johannesburg, Durban and Bloemfontein and just 20 km from Harrismith, you can be sure of a getaway to remember. The comfortable house is spacious and consists of lounge, dining room, kitchen, four bedrooms (main bedroom en-suite); bathroom with bath, shower, toilet and washbasin; enclosed veranda with seven single beds. There is a lovely braai area where sociable evenings may be spent around the fire. The house is fully equipped with linen, cutlery and crockery for 15 people. Please bring your own bath towels, decoder and sim-card. A cleaner will be on site to service the house daily. Free entrance to Sterkfontein dam. 24164 page views since 18 Mar, 2010.